Southerners push to rebuild habitat for a keystone reptile at risk. Eyeball to eyeball, the gopher tortoise sports an all-knowing look of certainty that might come from living in its Coastal Plains habitat for thousands of years. Try to photograph it and the bulky tortoise moves quickly for an animal reputed to be less than a natural-born speed demon. Sturdy and tough, the tortoise and its burrows sit at the heart of a rehabilitation project in the Southeastern U.S. Those lengthy burrows, built by the tortoise in a sandy region once home to a large longleaf pine forest stretching along the Coastal Plain from Virginia to Texas, are essential to more than 350 other species. Remove the tortoise and some of those others, at least, will disappear. To try to reestablish gopher tortoise habitat in Georgia, conservation groups and government agencies have teamed together in a five-year $150 million public/private effort. The Gopher Tortoise Conservation Initiative aims to protect 100,000 acres and 65 viable populations of 250 tortoise adults each. If successful, that should keep the gopher tortoise from being placed on the threatened or endangered species list, with government regulations that would limit what landowners could do on property. “Nobody wants that to happen. That’s why there’s a big push to preserve the gopher tortoise habitat,” says Reese Thompson, a tree farmer and landowner at Vidalia, Georgia. 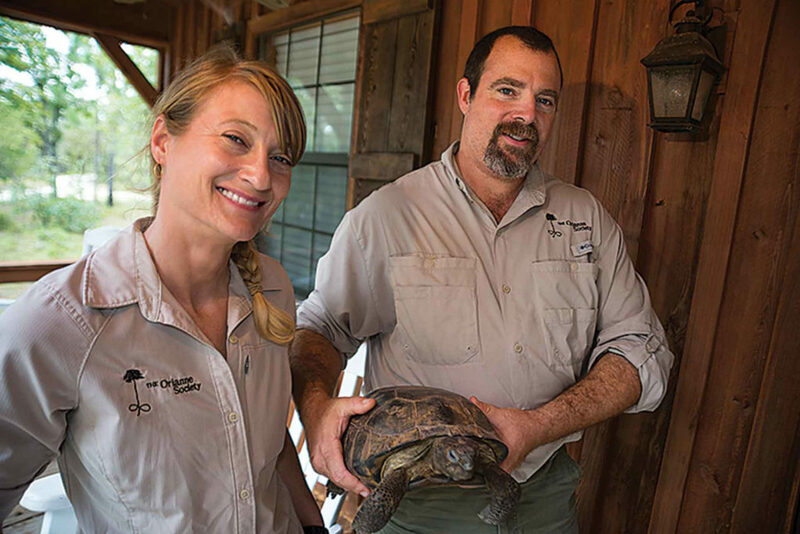 Heidi Hall and Chris Jenkins, officers with the Orianne Society, hold a gopher tortoise about 25 years old. Active in the state’s tortoise conservation effort from its beginnings, Thompson has a regular longleaf pine planting program, and put in 200 acres of it in 2017. “Longleaf pine timber and groundcover are the priceless treasures that most people don’t realize,” he says. Dwindling pines. Historically the dominant tree in the Coastal Plains of the Southeast, longleaf pine decreased to a small percentage of its range. One reason: we dutifully extinguish forest fires before they get too large. “Historically, large fires would burn all over southeast Georgia every year. Now we don’t have wildfires at the scale they did years ago. That means things like wiregrass, which is an essential plant species, can’t produce seed. To conserve all these increasingly rare species, you need to implement prescribed fire,” says Chris Jenkins, chief executive officer of the Orianne Society, which is dedicated to helping troubled reptiles and amphibians. Heavily involved in the gopher tortoise program through its Longleaf Savannahs Initiative, Orianne owns a Georgia preserve where controlled burns are part of the annual management system, and keeps its own professional fire crew on hand. “The longleaf pine, the wiregrass and fire, it’s all interconnected. The tortoise wants open ground for food. It thrives in an open system. Creating its burrows attracts other species. It’s one of the best examples of a keystone species. It’s the keystone to the longleaf pine ecosystem. Over 350 other animals use its burrows,” Jenkins says. With partners ranging from the Orianne Society to the Nature Conservancy, Conservation Fund, and the Bobolink Society, among others, to agencies ranging from the U.S. Fish and Wildlife Service and Georgia Chamber of Commerce to the U.S. Department of Defense, the tortoise initiative is more than a bit unusual. “I’ve worked in the conservation field 20 years and this is the first time I’ve dealt with groups that proactive in avoiding a problem,” says Steve Friedman, chief of real estate for the Georgia Department of Natural Resources. 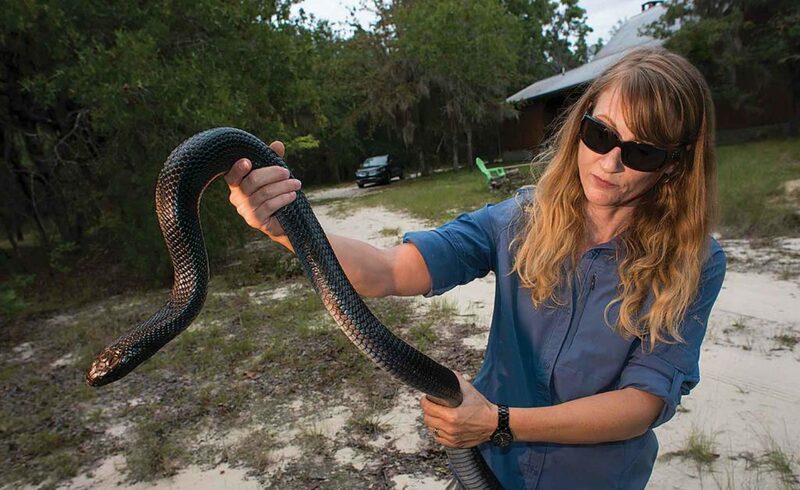 Heidi Hall with an Eastern Indigo snake, which depends on the tortoise for survival. Developing habitat. Much of the program so far uses state-owned land. Georgia bought some privately owned land, for wildlife management areas available for recreation, where tortoise habitat can be developed. “Right now, we consider 47 gopher tortoise populations with at least 250 adults to be protected, so we’re well on the way to the goal of 65 viable populations protected,” Friedman says. The gopher tortoise is already considered threatened in western Alabama, Mississippi, and eastern Louisiana. In addition, the Eastern Indigo snake, which uses the tortoise burrows in wintertime, is already considered threatened. That gives backers an incentive to push quickly. Quebec farm finds success producing guardian donkeys.